Mario Farnbacher’s early flying lap was enough to give Honda Team Motul the fastest time in Pre-Qualifying ahead of Saturday’s California 8 Hours at WeatherTech Raceway Laguna Seca. 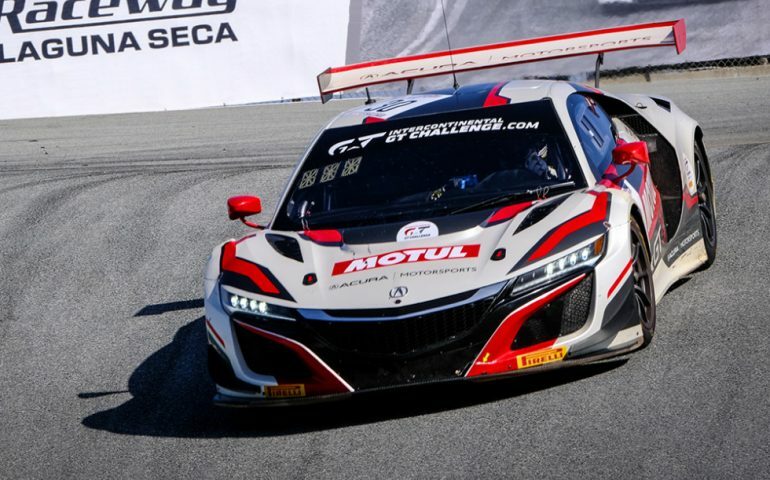 Under sunny skies the German lapped his new NSX GT3 Evo in 1m24.060s to set an early benchmark that would remain unbeaten throughout the 90-minute session. However, that was just under a tenth shy of Kelvin van der Linde’s time from the third and final test session, which took place in similar conditions this morning. Porsche came closest to toppling Farnbacher courtesy of Park Place Motorsports’ Sven Muller who finished just 0.089s shy of the Honda, while Wright Motorsports example of the new 911 GT3 R was a tenth further back in third. The third-placed car is being driven by Liqui-Moly Bathurst 12 Hour winners, Matt Campnell, Dennis Olsen and Dirk Werner. Walkenhorst Motorsport again finished best of the BMWs in fourth and just two tenths shy of the ultimate pace. Their M6 was a similar margin clear of 2018 winners Audi Sport Team Land and the first of M-Sport’s Bentleys, which spent the first half of the 90-minute session in the garage. Elsewhere, BMW Team Schnitzer’s M6 GT3 completed a top-seven covered by just 0.9s. LIVE COVERAGE of the event is available via the ICGT website here.